Includes a free preview of future issues in the collection US Constitut.230th Anniversary . For more information, please refer to the Satisfaction Guarantee tab below. If you do not wish to preview future issues in the collection, you may purchase the single item using the 'Individual Item Only' tab at right. Adopted in 1787, our Constitution began with these words: We the People of the United States, in order to form a more perfect Union, establish Justice, insure domestic Tranquility, provide for the common defence, promote the general Welfare, and secure the Blessings of Liberty to ourselves and our Posterity, do ordain and establish this Constitution for the United States of America. 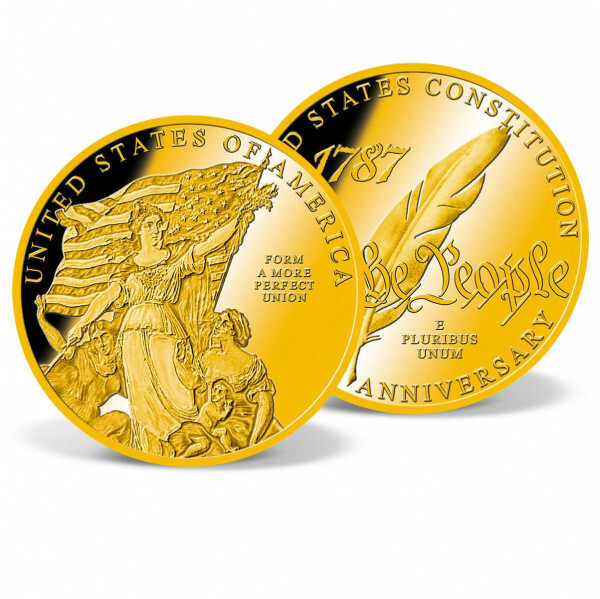 Today, American Mint celebrates the 230th anniversary of this historic document with a series of gold-layered coins inscribed with key phrases from the famous preamble. 1775 - The American Revolution begins.May 10, 1775 - The Second Continental Congress meets for the first time to oversee the colonial war effort. July 4, 1776 - The Declaration of Independence is ratified, announcing the formation ofthe United States of America as a new nation. December 16, 1777 - February 2, 1781 - The Continental Congress drafts the Articles of Confederation, an agreement that establishes the United States as a confederation of sovereign states. Ratified by all 13 founding states, the Articles of Confederation serve as the country's first constitution. March 1, 1781 - The Continental Congress is replaced by the Congress of the Confederation, which forms the basis of the new U.S. government. September 3, 1783 - Great Britain signs the Treaty of Paris, formally recognizing the independence of theUnited States of America. May 25 - September 17, 1787 - Fifty-five delegates from across the newly independent United States convene the Constitutional Convention to establish a central government. After months of intense debates, the Constitution is adopted and sent to state legislatures for ratification. June 21, 1788 - Delaware, Pennsylvania, New Jersey, Georgia, Connecticut, Massachusetts, Maryland, South Carolina, and New Hampshire become the first 9 states to ratify the Constitution, establishing it as the governing document for the United States of America. August 21, 1789 - James Madison proposes a series of amendments to the U.S. Constitution during the 1st U.S. Congress. These amendments, known as the Bill of Rights, guarantee certain personal freedoms and outline key limitations to state and federal government. December 15, 1791 - The Bill of Rights is ratified by ¾ of the states and is formally adopted into the United States Constitution.